HIGH-RIDING Highlands Park have now equalled Thanda Royal Zulu’s record of having gone 19 matches unbeaten in the National First Division (NFD). The now defunct Thanda claimed the 19-game record last season and now Highlands are set to make it their own after equalling the tally this past weekend with a 7-1 pasting of Mbombela United. The Lions of the North have been in their own league this season in the NFD. Opponents seem unable to put the brakes on them and they look set to walk straight into the top flight. The Owen Da Gama and Allan Freese train is now on auto, running smoothly without a need for constant supervision. Highlands, who were relegated from the Absa Premiership last season, have not lost a league match since September last year. Their last defeat was on 23 September when they lost 1-0 to the same Mbombela at KaNyamazane Stadium. That was before the appointment of Da Gama, who has yet to taste defeat in the league since joining the club with his assistant Freese. And now, with six games remaining in the season, they are two victories away from being guaranteed a PSL spot for the 2018-19 season. 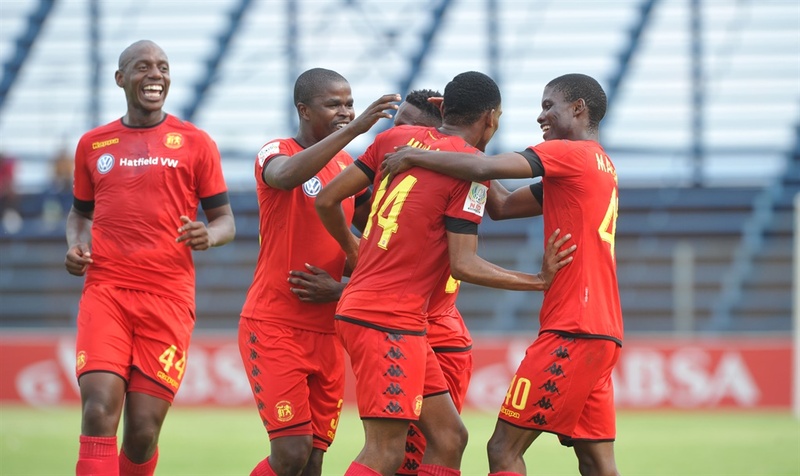 The roaring Lions of the North have moved 15 points clear at the top of the NFD table following their thrashing of Mbombela at their slaughterhouse, Makhulong Stadium in Tembisa, over the weekend. Their chief abilities this season, which have propelled them into the position they occupy today, were their free-scoring strikers and tendency to concede less frequently. In 24 matches played so far, they have scored 47 goals and conceded just 10. Former SA Under-23 player Mothobi Mvala, who was part of the 2016 squad that represented Mzansi at the Brazil Olympics, as well as Namibian international Peter Shalulile, are two of the players who have played key roles this season. The pair, who were also part of the team when they gained promotion to the top flight via the play-offs in 2015-16, have contributed 20 goals this season. Mvala has scored nine and Shalulile 11. Although they have 53 points to their name along with the 15-point lead on second-placed Black Leopards, Mvala played down talk that they are on their way to the PSL. Thank you, your comment has been submitted. 1 TZOZO: I WAS A PIMP! 2 SKOBOS ARE BEASTS IN THE SHEETS! 3 WATCH: MAN ENJOYS FLOODS!